Super nice facilities. Very clean. Location is good too, easy walk into the historic center. Also easy to get to/from the train station on the tram. Simply the cleanest, friendliest, nicest hostel in Lviv, great quite location just next to the park. Nice clean hostel located on the top floor of the building. I gave this place a 10 mainly because I only realised I had left my ipad behind after arrived in Poland and Tetiana agree to meet me across the border to hand it back to me in person. What a legend! The hostel is very new and clean. It's in a good location not far from the old town. It is on the fourth floor of the apartment building so if you have trouble with stairs it could be difficult. I stayed in the private double room with ensuite. The receptionist was lovely and there were no issues checking in or out. 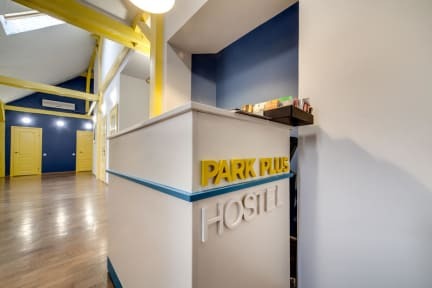 I stayed at 3 different hostels in Lviv and Park Plus was the best one by far even though it was the furthest away from the center. It is a modern and very clean hostel. The drawbacks are that it is a bit of a walk to the center, but not unreasonable, and the hostel is located at the very top of a building with no elevator so if you have heavy luggage or have trouble going up and down stairs, take that into account. The place is really nice, clean, well-located and worth for the money. What I really didn't like was, I was staying in a private room and I was taking a nap in the afternoon in my underwear and suddenly, the girl from the reception opened my door, which was locked, with a strange guy! I woke up and looked at them like: what on earth! She didn't even apologized later, too rude and unprofessional. The usual east european hostel: an old broken down top floor apartment refurbished into a hostel. The rooms aren't really meant to handle so many people in them, so during autumn and winter the rooms will be very wet and moldy and smelly. Otherwise, a nice simple hostel, friendly staff, also, don't expect much from the kitchen.